The LG Cookie brought something special to the mobile phone market last year – a basic, and more importantly, an affordable touchscreen phone for people who so badly wanted in but couldn’t necessarily afford any of the more popular and high-end touchscreen handsets. Could this be the beginning of a new trend? 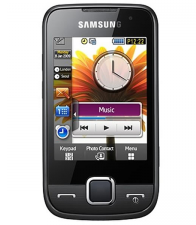 The news of the Samsung GT-S5600 certainly suggests so. It was initially unveiled at MWC last week, and since then, it’s been popping up all over the web and being touted as a rival to the LG Cookie – i.e. another reasonably priced touchscreen phone. It’ll sport Samsung’s TouchWiz UI as well as the home screen widgets which have become a standard feature on many a Samsung handset. Specs are currently a mystery, as are availability and pricing details – Samsung is happy to keep those lips locked for now. But as soon as we know more, so will you. Have a break, have a human Kit Kat: Vending machines get personal in the UK! So i’ve been considering buying the cookie (my current phone is a V3X). I’ve read the GSMArena review and I have a general idea of some of the drawback. However comparing the features with the price I feel it’s quite worth. So I would like your (the users) opinion. Please tell me what you don’t like about the phone. ( I wouldn’t mind if you also post what you do like about the phone). I’m really tempted to go for it however I’d rather have the opinion of some first-hand users. This would be a great help in coming to a decision and (if I do purchase one) get ready to expect some of the drawbacks share your comments with me at http://www.LG-Cookie.com Take care. !